A local issue has been brought to my attention by a fellow liveaboard boater. It bothers me so much that I not only want to bring it to your attention, but I am urging you to take action to help an “Off-Gridder”. A Cape Coral woman refuses to use city power and water. But now, she has a month to “plug in” or face the consequences. We met with the woman in a legal battle with the city to protect her way of life. It’s a lifestyle some can only afford to dream of living. “If I could figure out how to do it, I would probably do it too,” said Cape Coral resident Slyvia Lavandier. Robin Speronis figured out how to do it more than a year and a half ago. “I’m choosing to live without being dependent on the system,” said Speronis. Speronis is living “off the grid” as she describes it. “I never have to worry about that bill coming in,” said Speronis. No city power or water running through her house walls. Instead, she uses solar panels and treated rain water for survival. It’s a way of life that’s she says is being challenged by city code enforcement. “When this was brought to my attention I felt like I had to act. I felt like Cape Coral was intruding in the woman’s lifestyle,” said Todd Allen, Speronis’ Attorney. Allen took Speronis’ case on for free. On Thursday during a special hearing, the two sides met to discuss the legality of her living arrangements. There a special magistrate ruled Speronis was not guilty of not having a proper sewer or electrical system; but was guilty of not being hooked up to an approved water supply. “What happened here is people don’t talk to us or cooperate. We don’t communicate then we are forced to use the legal tools at our disposal,” said Frank Cassidy with Cape Coral Code Compliance. City code officials say this isn’t a case of singling out an individual, but making sure everyone follows the rules. “In the whole scheme of things, its no different than the hundreds of cases we deal with all the time,” said Cassidy. Speronis now has a month to comply — though she has no intention of giving in. “I don’t have to justify my life. They have to. That’s the way our system of justice works. They have justify it. I don’t,” Speronis said. EE COUNTY, FL - UPDATE: Robin Speronis pleaded not guilty to the charge of violating her probation on Tuesday, May 27. She was denied bond, and represented herself in court. A new hearing is scheduled for next month. 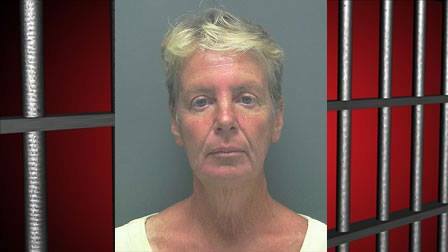 A Cape Coral woman known for her off the grid lifestyle was jailed Friday, following her arrest earlier in the week on a charge of animal cruelty. Robin Speronis has been living without city power and water for more than a year. She owns two pet dogs: a 7-year-old Chihuahua and a 14-year-old Lab, which Lee County Domestic Animal Services investigators seized last month in order to provide medical treatment to them. Speronis allegedly told investigators the Lab’s worsening skin condition was caused by “elephant skin”, and had been evident for the last nine years. Authorities eventually returned the Chihuahua. Speronis also allegedly told authorities she believed steroids and antibiotics kill good bacteria. Investigators say they have been trying to check on the welfare of the dogs since December 2013, but were never allowed access. During her first appearance Friday in court she was denied bond. However, authorities say when they asked Speronis to care for the animals, she responded by singing the song “Faith” by George Michael, which is also one of her dog’s names. Speronis has been arrested before, including once on a felony larceny charge. She was on probation during her latest arrest. The animal cruelty charge resulted in Speronis violating her probation, and she is being held on the Widman Act. Some neighbors think Speronis is getting a raw deal. “I think animal cruelty charges is just another quiver of stuff they want to use against her,” Smolik said. Meanwhile, Speronis is still in a legal battle with the city of Cape Coral involving her off the grid lifestyle. She has been racking up fees daily, and city officials say they will have to wait for this latest case to proceed before taking any further action. I don’t know this woman, or all of the particulars, but as a liveaboard boater I’m deeply concerned about personal freedom. I’m also not connected to the grid when I’m out at anchor. We also collect rainwater on occasion to supplement our fresh water supply. I admire anyone who wishes to be less reliant on the modern way of utilities connection. Many liveaboard boaters utilize solar and wind power to run their systems. I’m all about being self-sufficient and this woman is simply being harrassed to a horrible degree for being different. What can you do? You can send an email to the mayor and council. I’ll supply you with their email addresses below. Here’s what my friend sent. It’s a bit long but very well written. I can attest to her sincerity. Please take a few minutes and let the leaders of Cape Coral know your thoughts on this. It is time to release Ms. Robin Speronis from jail. Your city is making a laughing stock of itself by bullying and jailing a woman based on alleged animal cruelty charges simply because the city feels impotent and threatened by a single woman trying to live off the grid. We have compiled a list of organizations who we have already contacted with details of this story (please see list below). Please take a step back and look closely at what your city is doing to this woman and act responsibly in releasing her from jail. Ms. Speronis is not a criminal for wanting to test life by living off the grid. If indeed she needs help with animal care, then find resources to help her to care better for her dog. You know that jail-time is not the answer in this situation, yet you all are willing to let this woman languish in a jail cell while you comfortably relax at home. We hope that national exposure to this story will motivate you to act more humanely toward Ms. Speronis. The name and reputation of your city is at stake. National recognition of the absolute absurdity and unfairness of the imprisonment of Ms. Speronis will reflect very badly on your city. Is this how you wish to be known around the world? Think carefully about how you want Cape Coral to be recognized for years to come, because right now your city is rapidly becoming the place that jailed a woman for wanting to live a unique and environmentally friendly life-style. That will be the legacy of Cape Coral if you choose to allow this situation to continue as it is. There needs to be a better solution; so please put your heads together and use more imagination in resolving this unique situation – jail is not the answer. The following entities have been contacted with details of this situation. This partial list will grow until Ms. Speronis is released from this abusive imprisonment. Please take action to release Ms. Speronis immediately. It is the right thing to do, as your conscience will tell you. Many of you are pursuing your own off-grid lifestyles or have plans to do so in the future, whether it be in a cabin in the woods or aboard your cruising boat. These types of infringements on personal freedom can have an impact on your future. Please consider spending a few minutes speaking your mind to the mayor and council of Cape Coral Florida. Ed Is Author of the terrific book: "Quit Your Job and Live On A Boat." - A Terrific read! I really enjoyed it! ~Dave Webster of Facebook's "Living Off The Grid"